Dusk on the day of the Geminid maximum saw me standing on the end of my drive, fiddling around with my 16” Dob’. The sky was clear, the air icy cold and night was falling in late afternoon. It was the 13th December and with Advent underway and a crisp frost on the fields opposite, twinkling fairy-lights in a garden up the hill, there was a definite Christmas spirit abroad in the little village where I live. A neighbour was passing up the lane with his two Springer Spaniels and he had stopped to ask a few questions about the constellations just popping into view in the darkening sky. He was looking at The Plough in the north; I was looking overhead. A brilliant Geminid meteor zoomed through the zenith, leaving a sparkling star-dust trail, just like a giant firework rocket. “What?” My neighbour had missed it completely. Later that evening a friend and I parked at the foot of the local fell and traipsed up in the dark, carrying DSLRs on tripods. The intention was to capture the kind of Geminid I had seen earlier. The car thermometer had registered about -3, but the wind was brutally cold: it beat us back from the cairn at the summit where we usually setup, but even lower down among the gorse bushes it was bitter. With four layers of fleece and my thickest down jacket, layers of balaclavas and hats, I was still freezing cold after twenty minutes, my feet and hands going numb after thirty. We survived less than an hour, pointing our wide-angle lenses at Gemini over the Bay and taking one thirty-second exposure after another. Nothing, not a single meteor of any sort. The cold conquered us in the end and we hobbled back down on feet so numb that frostbite seemed a real and unamusing possibility. Later, having finally warmed up, I decided to have a final go. I mounted my DSLR on top of the refractor in my observatory and slewed to Gemini. With the mount tracking, I started taking long exposures again, one after the other. After half an hour, Gemini remained meteor-free and I changed aim to Orion, just for a change of scene. At least sheltering in my POD was a good deal warmer than the exposed fellside had been. Eventually, at about eleven thirty, the sky started to cloud over, gradually turning sodium-orange as the gathering haze reflected the lights of Lancaster and Blackpool across the bay. Still hoping I might capture a bright Geminid like the one I had seen at dusk, I continued until the last of the bright stars – Betelgeuse and Rigel – were gone behind the murk. Finally, defeated, I switched the camera off and started to pack up. 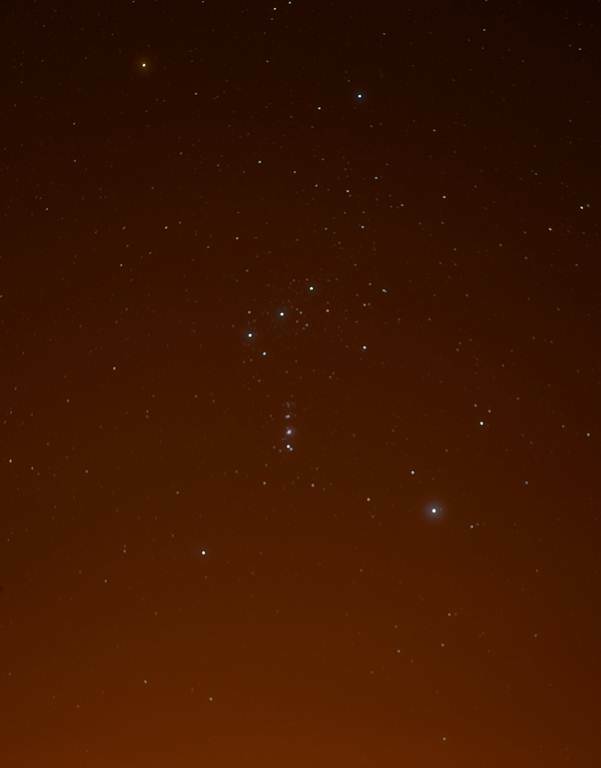 At that moment – well certainly within a minute – a huge fireball lit up the clouds from above, going straight through where Orion had recently vanished, heading for the horizon. It reminded me of a brilliant Roman Candle seen through smoke - the colour of burning Magnesium. Luminous enough to cast shadows, it was the brightest meteor I have ever seen; if I’d kept snapping for another minute or two I’d certainly have caught it. I’m not a fisherman, but at least now I’ve got a one-that-got-away story to tell the descendants.